Lack of time is a common excuse for missing the most important meal of the day. But, as parents, it’s important for us to serve as role models for healthy eating habits that can last a lifetime. Start the day right! 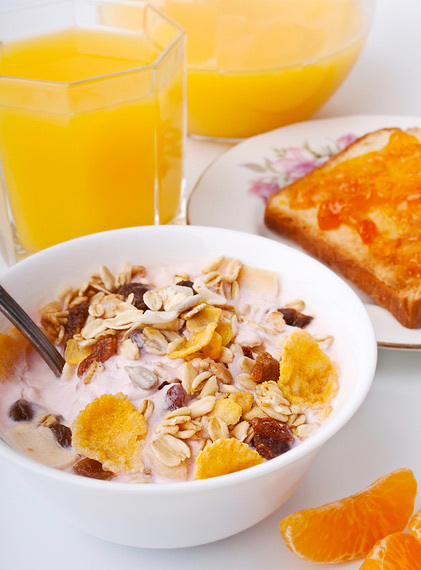 Encourage children to eat breakfast either at home, school or at daycare. Remember, growing children need to eat a nutritious breakfast to keep up with their body’s nutritional needs, problem solving at school and staying healthy. Organize clothes, backpacks and school work before going to bed. Set the table and lay out nonperishable foods (bananas, dry cereal, raisins) before going to bed. Let children participate in the breakfast selection and preparation. Peanut butter and sliced bananas over whole-wheat toast and a glass of low-fat milk. Bagel with a slice of melted mozzarella cheese. English muffin with peanut butter and slice bananas. Cereal with strawberries and lowfat milk. Flavored yogurt with fresh fruit topped with whole-grain cereal. Biscuit topped with pizza sauce, slice of deli meat and melted cheese. Peanut butter spread over an apple topped with raisins. Leftover pizza and a glass of juice. Quesadilla with a corn tortilla and lowfat cheese. Hard-boiled egg served with crackers and a glass of calcium fortified, 100% juice. Frozen berry mixture (micro waved until warm) poured over whole-wheat waffles. Serve pancakes. Keep pancake batter in the refrigerator, ready to pour on the griddle. Smoothie made with frozen pineapple and low-fat yogurt. Pita pocket filled with a scrambled egg and refried beans. Add dried cranberries and almonds to instant oatmeal.